85 days. A favorite Asian variety of Dr. Amy Goldman, author of Melons for the Passionate Grower. 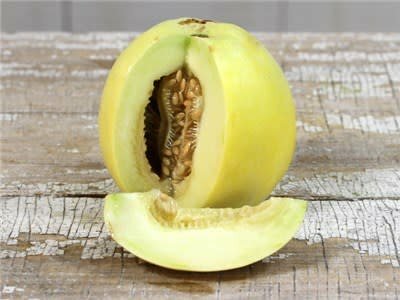 These small 3”-4” round melons are very sweet with a high sugar content. Oriental varieties open a whole new dimension to melons as they are amazingly different. Crisp and crunchy ; they have edible skins. Their small size and light, golden rind make them very attractive. This fine Japanese variety was developed by Sakata’s Seed Co., of Yokohama. This is a must for marketing. They are in high demand by melon lovers and command top prices! Rare and colorful.